For oral use only. Shake the bottle for at least 10 seconds before use. Always use the syringe supplied with the pack. Never give more medicine than is shown in the table. Do not exceed the stated dose. 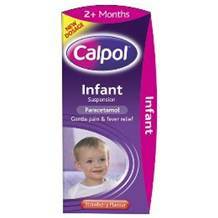 Child's Age - 2-3 months; How Much: 2.5 ml. If necessary, after 4-6 hours, give a second 2.5 ml dose. Child's Age - 2-3 months; How Much - 2.5 ml. If necessary, after 4-6 hours, give a second 2.5 ml dose.